Technology Transfer helps ensure that Reclamation's research reaches the users in the most effective way possible, via information dissemination or intellectual property protection. Generally, technology transfer occurs through technical publications, workshops, demonstrations and integrations into Reclamation's operations, patents and licenses, and partnership confidentiality agreements. 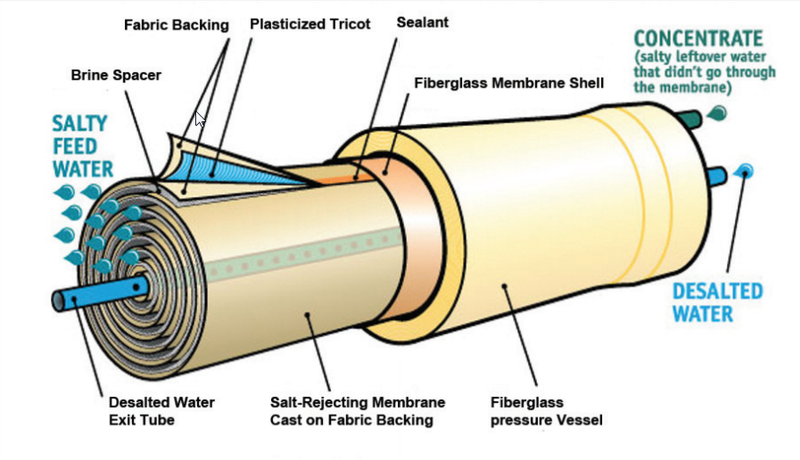 Contact R&D's Technology Transfer Staff for more information. (Nov. 7, 2016) Reclamation recently received a Notable Technology Development Award recognizing new technologies designed to serve the common good. 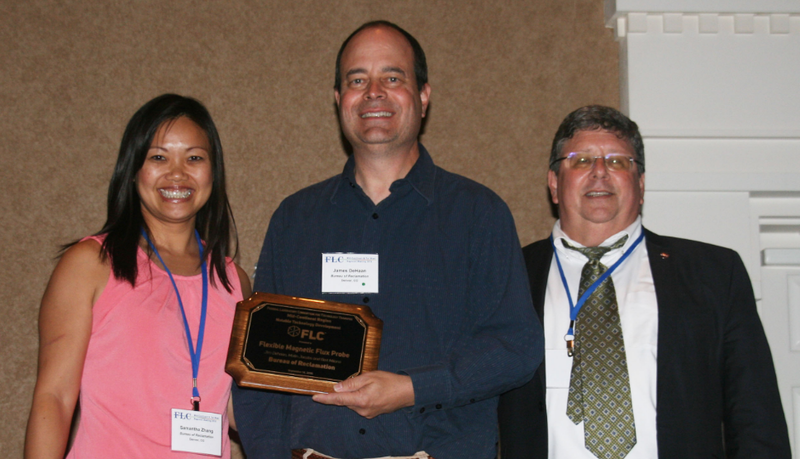 The award was given by the Federal Laboratory Consortium Mid-Continent (FLC MC) for the Flexible Magnetic Flux Probe. The inventors of the Flux Probe are Jim Dehaan, Malin Jacobs and Bert Milano. 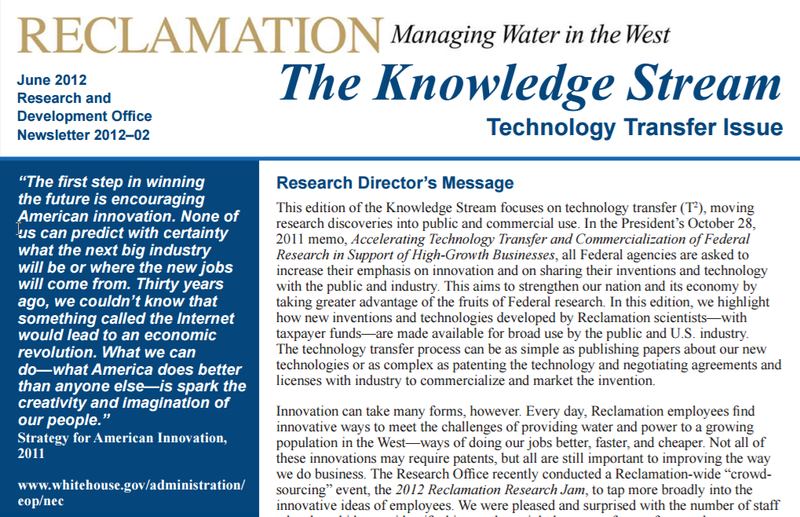 (Summer 2012) This edition of the Knowledge Stream focuses on technology transfer (T2 ), moving research discoveries into public and commercial use. In the President’s October 28, 2011 memo, Accelerating Technology Transfer and Commercialization of Federal Research in Support of High-Growth Businesses, all Federal agencies are asked to increase their emphasis on innovation and on sharing their inventions and technology with the public and industry. This aims to strengthen our nation and its economy by taking greater advantage of the fruits of Federal research. In this edition, we highlight how new inventions and technologies developed by Reclamation scientists — with taxpayer funds — are made available for broad use by the public and U.S. industry.